The efforts of our professionals have enabled us to offer clients a wide range of ultrasonic distance meter(Professional), which are procured from vendors based in various parts of the country. These components are manufactured using quality material to ensure they are par with the international quality standards. All the components are manufactured at our vendors' facility under the guidance of the experts. These can be availed in bulk quantities at the market leading prices. Size 120 X 50 X 30 mm. 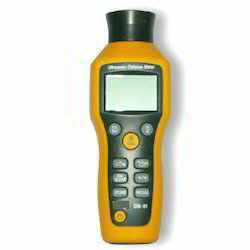 Portable Laser Distance Meter takes instant & Reliable Measurement up to 100 Meter & is easy to operate. 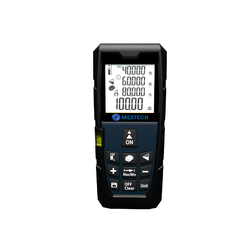 Features : Distance , Area & Volume Measurement. Indirect measurement by Pythagorean TheoremContinues Measurement Function. Operating Temperature: 0˚C -40˚C.Storage Temperature: -10˚C -60˚C. Power Supply : 2 X 1.5 Volt AAA Size Batteries. Portable Laser Distance Meter takes instant & Reliable Measurement up to 40 Meter & is easy to operate.Specification :Measuring Range : 40m/ 120-ftAccuracy : ±1.5mm 1/16 inMeasurement unit : mtr/in/ftFeatures : Distance , Area & Volume Measurement. Indirect measurement by Pythagorean Theorem Continues Measurement Function. Front Bench Mark & End Bench Mark Measurement Systems Min/Max Values Easy addition/subtraction of measurement Switchable among meter(m), inch (in), feet (ft) Large LCD with backlight Low battery indicator Auto / manual power off function Operating Temperature: 0˚C -40˚C. Storage Temperature: -10˚C -60˚C. Power Supply : 2 X 1.5 Volt AAA Size Batteries. Unit Size : 120 X 50 X 30 mm. Weight : 110 gms (Including Batteries ) Accessories : Instruction Manual, 2 pcs 1.5V Batteries. Our Portable Ultrasonic Distance Meter DM01 are immensely used in industries like oil, thermal power, power, chemical and petrochemical. These meters are renowned in the industry for its quality and versatile applicability. We source this range from the authentic vendors of the industry after ensuring its quality.